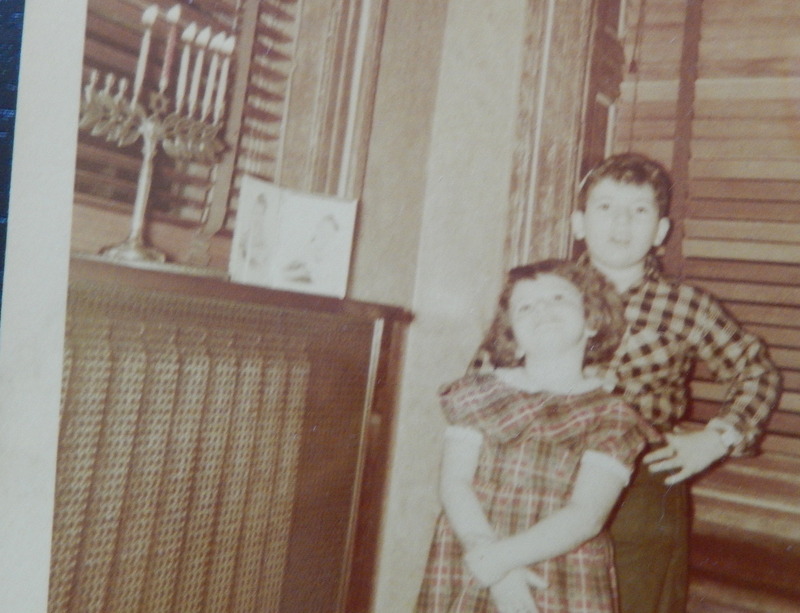 Ellen and her brother celebrate Chanukah in Williamsburg, Brooklyn with the family’s bronze menorah. I was about 4 when I went with my mother to buy the first and only menorah I remember my family having. I asked her many years later what we had done before and was told we used tin, throw-away menorahs. Perhaps we didn’t event light candles. I don’t know why we were buying a menorah that year. Maybe my brother, three years older than I, had started Hebrew school and my parents felt we should have a more formal Chanukah. In any case, it was just my mother and I that day. My father was at work, my brother in school. Memory is a funny thing. Two people can participate in the same event and remember it differently, influenced by what actually happened, by what people tell them happened and by later experiences. We fill in the holes, move the pieces and create what we remember. Is what I remember accurate? There’s no way to know. It is, however, what I remember. My mother and I left the brownstone where our family lived in the Williamsburg section of Brooklyn to walk the five or so blocks to Broadway. Broadway was a kind of mystery to me then, filled with stores, restaurants, the local movie theater. Cars and busses travelled along cobblestoned-pavement and over unused trolley tracks. And casting a permanent semi-darkness and rumble over everything was the elevated section of the subway line that could take us to Manhattan. Ellen and her mother bought this brass menorah for their Brooklyn home. We gazed in the windows of the various stores until my mother found what she was looking for. The brass menorah had a leaf-like pattern to hold up the candles. In the center, resting on a Star of David and taller than the four candle-holders on each side of it, stood the holder for the shamas, the candle that lights the other candles. It was probably only a few days, perhaps as long as a week or two, before the menorah was put to use. Oddly, as clear of the memory of going to buy the menorah is in my head, I have no memory of the first Chanukah we used it. Instead, all the Chanukahs that we celebrated in Williamsburg after its purchase blend into one image. The menorah was always placed in the side window of our living room. It sat on top of the radiator cover, which came up to the window sill. The menorah was visible to anyone who gazed up at our fourth-story apartment — and high enough to be out of the reach of curious little hands. 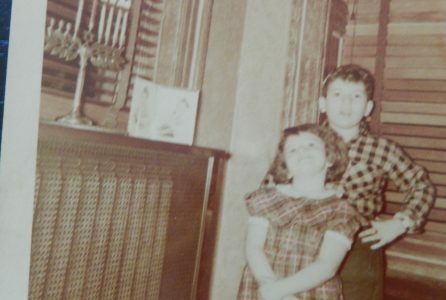 I picture myself in my “fancy” dress with its purple velvet top and taffeta plaid skirt, my brother in a flannel checked shirt, a white yarmulke perched precariously on his head. Each night we would alternate choosing candles — the wax colors seemed so much more intense then — until the little box of 44 was empty. 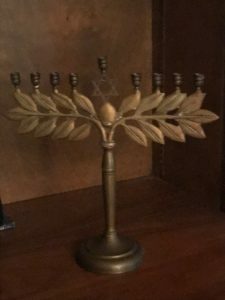 After the menorah was lit, I’d sit on the nearby piano bench and watch as the candles burned, dripping their wax down the branches, until the last flame went out with its faint glow and metallic tang. My brother and I would soon be arguing over who was picking off “an unfair” share of the wax. We moved to Queens when I was 12. There was no window perch for our menorah. The radiators were too low, the window sills too narrow to be safe. We placed a far less risky electric menorah in our living room window, tightening a bulb a night throughout the holiday. The brass menorah was placed on the dining room table. My brother and I wore whatever we were wearing when it came time to light the candles. At 15, he probably couldn’t care less which color candle went in each holder. And picking off the wax was no longer in contention. I still enjoyed watching the candles burn to the end, giving off that distinctive smell. The menorah Ellen’’s parents gave her and her husband shortly after they were married. 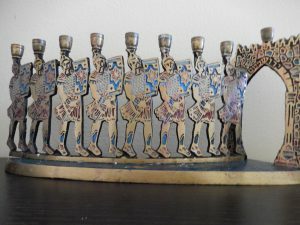 For the first Chanukah my husband and I celebrated after our wedding, my parents gave us a menorah, low sitting with red, blue and gold Maccabees as candle holders. It has moved with us from Connecticut to Minnesota to Massachusetts to Delaware. It is the menorah that my children, now grown with children and menorahs of their own, grew up with, taking turns choosing the candle for each holder. The brass menorah resides with my brother’s family, still fulfilling its yearly mission. My husband and I take turns selecting candles and, yes, we pick off wax together. And because each family should create some of its own holiday “traditions,” we guess which will be the first candle to go out each night. I still relish the peacefulness I find contemplating each candle as it burns to its end, watching the glowing embers extinguish themselves, waiting for the unique aroma that is part of my Chanukah.